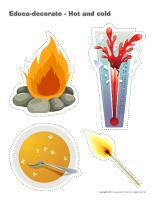 Explore thermometers, fire, ice, and contrasts with the activities included in this theme. 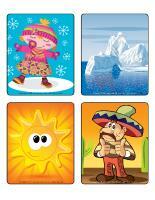 A hot and cold picture game, word flashcards, activity sheets, coloring pages, models, and so much more! 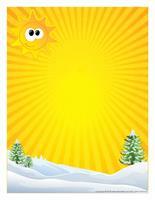 (Open thematic poster-Hot and cold) Print, laminate, and decorate the walls of your daycare with all kinds of posters. (Open educa-theme-Hot and cold) Print and laminate. Use the illustrations to present the theme to your group (and their parents) while decorating one area of your daycare. 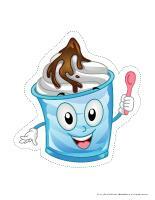 (Open educa-decorate-Hot and cold) Print, laminate, and cut out. Use the illustrations to decorate the walls of your daycare and set the mood for the theme. (Open garland-Hot and cold) Print. Let children decorate the garland. Cut it out and hang it within your daycare or near your daycare entrance. This special tool was created in response to a special request received. (Open group identification-The wolf group) Print and display in a specific location or in your circle time area. (Open educ-chat-Hot and cold) Educ-chat is a game which contains a variety of illustrations representing subjects, verbs, and objects children can use to make complete sentences and build their vocabulary. Print, laminate, and cut out the cards. Make three piles (subjects, verbs, objects). Ask a child to pick three cards, one from each pile, and read the sentence. The sentences will sometimes be silly, but you will surely have fun! You may also choose to place the cards yourself and ask a child to read the sentence. As a group, discuss temperature variations, warm summer days, rainy spring days, windy autumn days, and cold winter days. Deposit several different objects in the centre of your circle (sunglasses, mittens, scarves, bathing suits, sunblock, beach balls, raincoats, beach towels, rain boots, etc.). Display a picture that represents a specific season. Encourage children to identify the items used during this season. The pictures may be used as a memory game or to spark a conversation with your group. Use them to decorate the daycare or a specific thematic corner. 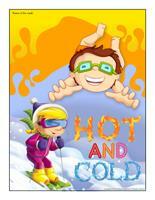 (Open picture game-Hot and cold) Print, laminate, and store in a Ziploc bag or in your thematic bins. 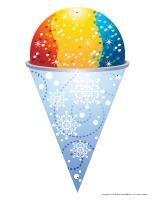 (Open activity sheets-Hot and cold) Print for each child and follow instructions. (Open writing activities-H like hot) (Open writing activities-C like cold) Print for each child or laminate for use with a dry-erase marker. (Open stationery-Hot and cold) Use this thematic stationery to communicate with parents, in your writing area, or to identify your thematic bins. Print. (Open game-This is my spot-Hot and cold) Print two copies of each illustration. Use adhesive paper to stick one copy of each illustration on the table. Place the second copy in a bag. Children take turns picking an illustration to determine where they must sit at the table. You may also use the illustrations to determine children's naptime spots or their place in the task train. (Open My hot and cold path) Print, laminate, and secure the illustrations on the floor of your daycare to create a path leading to the areas frequently visited by children throughout the day. The path can lead to the bathroom, the cloakroom, etc. If you prefer, use the illustrations to delimit various areas. (Open lacing-Hot and cold) Print, laminate, and punch holes around the contour of each shape. Children can thread a shoelace or ribbon through the holes. Sit in a circle with your group. Deposit one mitten in front of each child. Show your group a picture (Open picture game-Hot and cold) If the picture represents cold, children must put the mitten on. If the picture represents hot, children must leave the mitten on the floor. Show children an object before hiding it. When you give the signal, children must search for the object. Tell them they are "hot" if they are close to the object and tell them they are "cold" if they are far from the object. Once children have spotted the object, they can help you guide the others. Continue the game until everyone has found the object. Fill spray bottles with lukewarm water and add a few drops of food coloring. Bring these bottles outside and encourage children to spray the contents of the bottles on snow. Watch the snow change color and melt. 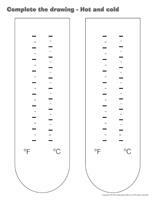 (Open educ-trace-Hot and cold) Print for each child. Children must trace the dotted lines using the corresponding colors and then color the objects. (Open association game-Hot and cold) Print and laminate. Children must associate the cards to the correct thermometer. 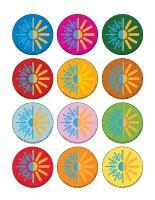 (Open educa-symmetry-Hot and cold) Print. Have children color the bottom picture to make it look exactly like the picture on the top. (Open educ-intruder-Hot and cold) Print and laminate. Children must find the six items hidden in the scene. (Open dress-up dolls-Hot and cold) Print and laminate. Leave the pieces out. Children will enjoy dressing the doll many different ways. For this activity, you will need several balloons. Fill half the balloons with cold water and the other half with lukewarm/warm water. You will also need a container filled with cold water and a container filled with lukewarm/warm water. Invite children to manipulate the balloons and transfer them from one container to the other to feel the difference in temperature. Let them gently squeeze the balloons, roll them on their arms, etc. Ask them which balloons they enjoy manipulating more. Deposit ice cubes prepared with water and drops of food coloring in Ziploc bags. Secure the bags on a large piece of cardboard or directly on a wall using adhesive tape. Use a hairdryer (manipulated by an adult) to quickly melt the ice cubes and watch them become colourful water. Children will be very impressed. Set several thermometers in different areas within your daycare: near a window, near a heater, in the shade, in the sun, in water, etc. Show children how the temperature goes up and down. 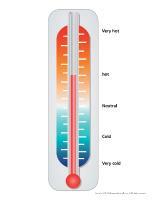 (Open thermometer) Display the temperature using the thermometer and invite children to color the corresponding mercury level using a red pen. Have children sit in a circle. Place a lit candle in the centre of the circle (set you candle holder on an aluminum pie plate). Observe the flame with your group. 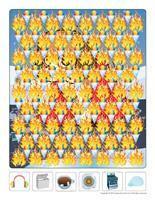 Help them notice how pretty fire is and discuss the dangers associated with fire. After a while, deposit a large glass container over the candle to extinguish it. Combine 1 cup of water with 2 cups of cornstarch. The mixture is ready when it easily releases from the sides of the bowl. The mixture appears to be liquid, but if you hit it, it will not splash. The mixture is a liquid when it isn't under pressure, but a solid when it is under pressure. Give each child a small handful of the mixture and ask them to make a ball with it. As long as they apply pressure, the mixture will remain in the form of a ball. However, if they stop manipulating it, it will quickly return to a liquid state in the palm of their hand. This activity should be done over a table. You may choose to have children wear aprons, but cornstarch does not stain. 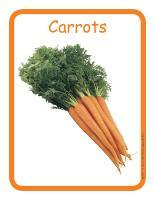 (Open educ-poster-Carrots) Print and laminate the posters and use them to present the food item to your group. The posters will make it possible for children to discover different forms of everyday food items. Display them near the table where children eat or in your kitchen area. Have children taste different types of foods. For a special twist, serve foods at unusual temperatures. For example, serve a cold carrot purée, melted ice cream, a melted Popsicle in a glass, hot chocolate with ice cubes, cold spaghetti noodles, etc. You may make interesting discoveries. When it's time for the afternoon snack, let children choose between a hot or cold snack. For example, you may have them choose between a bowl of ice cream and a bowl of oatmeal. (Open puppets-Hot and cold) Print the models on heavy cardboard. Have children cut them out and decorate them with a variety of materials. Glue a Popsicle stick behind each model to create puppets. (Open models-Hot and cold) Print the models and use them for various crafts and activities throughout the theme. Freeze water and food coloring in ice pop moulds and let children draw on heavy cardboard with the frozen ice. Children will enjoy exploring pretty colors and feeling the cold sensation on their hands. Have children wear big winter mittens to draw a hot item and a cold item on a piece of paper. Divide your group into two teams. Have the first team draw a picture using warm colors (red, yellow, orange) while the second team draws a picture using cool colors (blue, green, purple). (Open complete the drawing-Hot and cold) Print for each child. Have them complete the drawing by adding the missing elements. 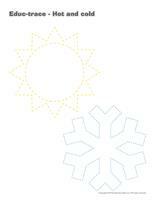 (Open I am learning to draw-A snowflake) Print and laminate the model sheet. Encourage children to practice their drawing technique on the model sheet. When they are ready, they can try to draw a snowflake on their own. 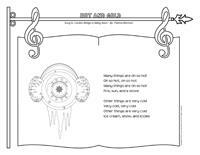 (Open coloring pages theme-Hot and cold) Print for each child.